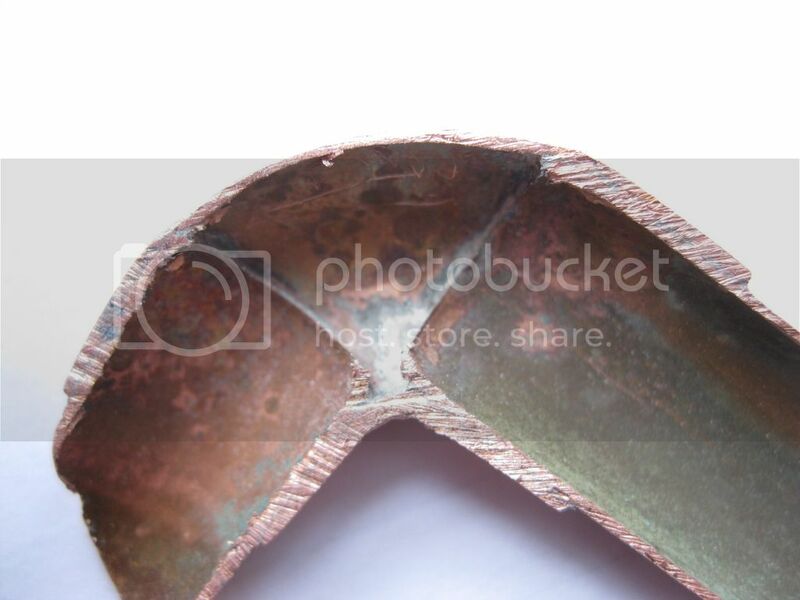 Discussion in 'Plumbing Forum' started by Roy_66, Mar 21, 2019. 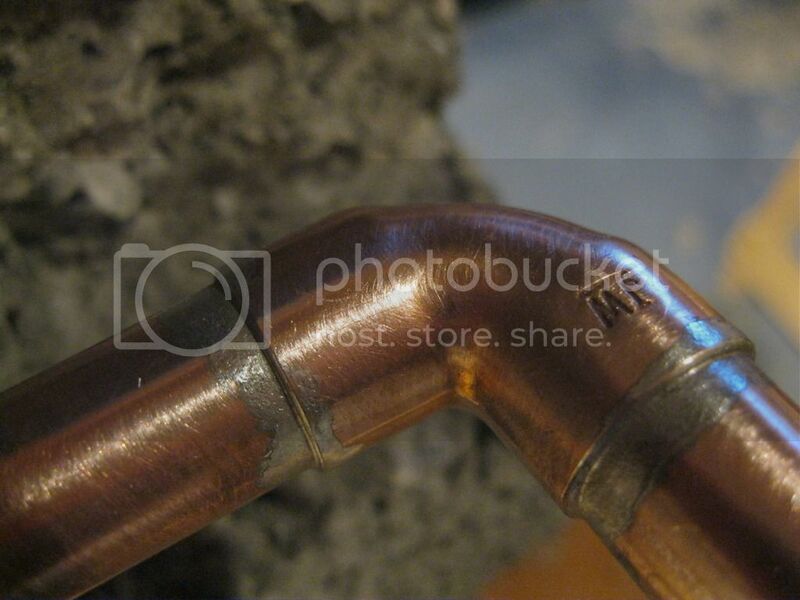 Discuss Soldered Joints Rough / Grainy Finish at top of Joint (Lead free Solder & Mapp) in the Plumbing Forum area at UKPlumbersForums.co.uk. Some pictures first to illustrate my Question (I understand as new poster I can't yet put them in direct). Can anyone give me view please on how to get better (smoother) soldered 15mm joints (I'm doing my lead free re-training at the mo) or if from pics above its "good enough". Quick waft around with torch (pipe also), then generally heat the middle of the fitting, then move underneath till I get a melt on the top of the joint, then wipe solder on. Flick off snots (if I remember) - just for practice. 3. Is the smaller Rothenberger cool tip foolproof against melting, if I go lower on the gas ? Watched loads of videos, but perhaps you have a favourite, as a good way to answer. Sorry trouble with the pictures . . . please see next reply . . . Sorry for slowness. Just guessed I can't put in pictures (even if hosted elsewhere) so replaced with links to photobucket. At a guess without seeing pics you might not be using enough heat to get decent flow and or you're wiping before the solder has set hence the grainy finish. If you have a great deal of snot you're using too much solder, try to start the solder at the rear of the fitting allowing capillary action to work it around. That way you get the best available finish as well as knowing if the solder has completely taken around the fitting without using too much. I had the same result with a higher torch level. I do try to apply the solder on the other side from the flame. Think I'll do just half a fitting as an experiment (i.e. only first joint), and only solder with the torch removed once I get a melt just to see how that looks (So the cause won't be the flame accidentally blasting the joint. The one in the picture had very large snots, and was well set before I wiped (I generally exit the garage and open the doors as soon as torch off, then come back and wipe clean etc. later). I'll also try a new pot of flux. My stuff will be behind a plastered wall, so I don't need to polish up ( . . . though I will ). I did do a training piece first, using leaded and lots of T-pieces and vertical fittings with sizes 28mm, 22mm. Only got into trouble when I got down to 15mm and the Rothenberger torch with standard as supplied large turbine tip overheated red hot cos I turned it down for the 15mm stuff. I guess when turned down the flame front goes into the head with bad results. (Instructions say 1 inch flame min, but everyone seems to thing that is wrong - just look at it for starters). Now got the smaller tip and jet, but perhaps still turned up too much. Will also have a go with Propane - think I've still got some. I agree with Rob Forster, MAPP is an acetylene substitute because it burns with a very hot flame. Try using a propane or butane torch instead. Another possibility is your flame is set towards the oxidising end of the spectrum (excess oxygen, blue hissing/roaring) but for soldering you want to be neutral or reducing. Thanks Chuck, thats interesting. I'll try turning down until all bright blue bit gone, but check first torch does not overheat before doing any soldering. I'll keep a count on how long until I get a melt and report back.